"Nothing better than fresh seasonal ingredients, slow-cooked until they are melt-in-your-mouth tender." Place bacon in a large Dutch oven and cook over medium-high heat, turning occasionally, until evenly browned, about 10 minutes. Remove the bacon slices to a plate lined with paper towels, reserving some of the drippings in the Dutch oven. Stir onion in reserved drippings; cook and stir until browned, about 10 minutes. Stir garlic into the onion; cook until softened, 1 to 2 minutes. Pour broth into the Dutch oven; add green beans. Chop bacon and add to the Dutch oven. Bring the broth to a boil, reduce heat to low, and place a cover on the Dutch oven. Simmer the green bean mixture until the beans are tender, about 1 hour. Add potatoes; season with salt and pepper. Continue cooking until the potatoes are tender, about 30 minutes more. To save time, I use kitchen shears to cut the bacon into smaller pieces as it cooks along with the onion. I also use butcher shop bacon and organic broth to avoid preservatives. 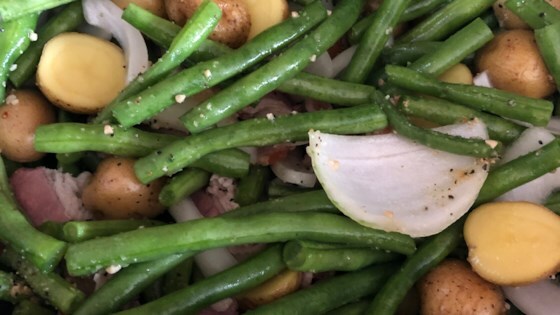 this recipe is made for fresh green beans and not frozen chopped onions. This is basically how my grandmother would make them. Delicious~! And yes, garlic is always welcomed in my house!